Data Doctor Pocket PC sms advertising software specially designed to send text messages from your Windows based mobiles to other cell phones. 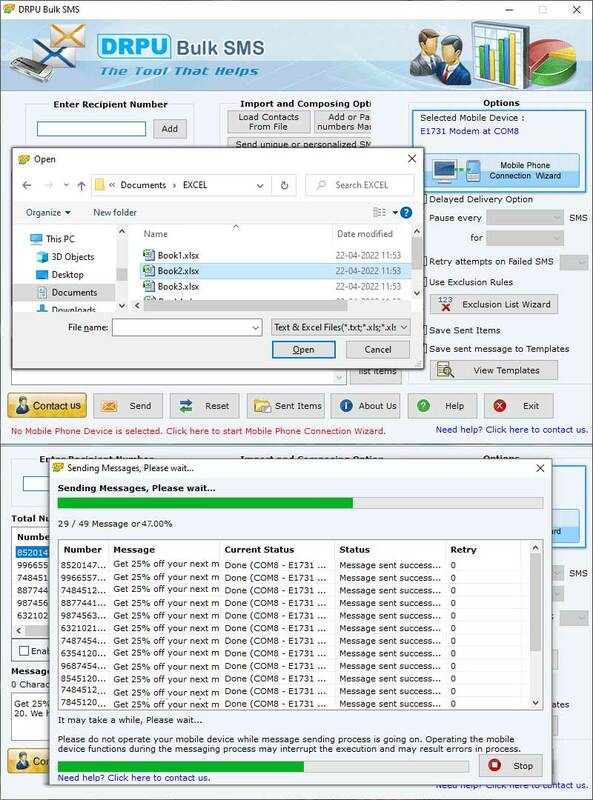 Pocket PC messages broadcasting utility sends unlimited text sms on both national and international GSM and CDMA mobile phones via Windows OS based Pocket PC, PDA and smart phone device. Advanced sms sending tool transmit messages including meeting alert to employees, personal sms, contest bulk sms, invitational card, promotional messages, seasonal greetings, alert notifications for any event, job alerts etc. Bulk sms sending tool provides comprehensive solution and helps user to instantly broadcast large messages to single or multiple groups at a time. Pocket PC sms advertising application is compatible with all latest branded Windows OS based phones such as Nokia, Motorola, Sony Ericsson, LG, Samsung etc. Messaging transmission program allow user to insert sender numbers manually, upload from phonebook memory or import from saved text file. Pocket PC to cell phone text sms broadcasting software support all Windows operating system such as Windows 98, XP, NT, ME, 2000 and Windows Vista. SMS sending program provides a complete step-by-step graphical user guide through which any technical and non technical user operate this software easily. Features: * Pocket PC sms advertising utility sends messages to either single or multiple user mobile phones on national or international mobile networks. * Pocket PC to mobile message sending utility transmits sms to any GSM or CDMA mobile Phones. * Software does not require any internet connection to send message to all over the world. * Messaging software broadcast unlimited bulk sms from Windows OS supported Pocket PC and PDA mobile device to any other cell phones. * Pocket PC sending tool facilitates to save entire details of messages with date and time for future references. Chatroulette Cone is a new and improved alternative to the popular Chatroulette video-chat application (chatroulette.com). It is an Adobe Flash? application that uses a lightweight back end service for handing video-chat session between strangers. Chat on qeep for FREE on your mobile phone. Whether you want to play fun live games, blog photos or send text messages, sound attacks or virtual gifts - you can 'qeep' in touch anywhere, anytime! Flash chat room component with lots of features and 100% customizable design, emoticons / smileys and sound alerts. Runs on any PHP5 web server and installs simply by uploading to FTP. Included are all source code files and manual tutorial (PDF). Software maioria de SMS Ã© uma ferramenta de mensagens de texto avanÃ§ado tecnicamente para compor e enviar mensagens em massa a partir do computador pessoal para um grupo de usuÃ¡rios de celular com antecedÃªncia GSM telefone com base mÃ³vel. Commercial Software Chat utility provides online interaction facility for users which have a many effective features like reliable, fast, easy to use and real time live communication between your website visitor and service centre executive. This site does not contain serial number, crack, keygen Pocket PC SMS Advertising Software serial number : serial number is the simplest type of crack. A serial number(cdkey,product key,etc) is register the program as you may already know. a crack or keygen may contain harmful software. If you cannot find the exact version you want, just give it a try. for more information read .nfo/.txt/.diz file include in zipped file.